NKMAA Certification for Dahn Rank is available to all Charter School owners in good standing, and they can also purchase the NKMAA Geup certificates (shown on the bottom right of the photo). These beautiful certificates have a Dragon on the left and a Tiger on the right side, and they are customized to have the name of YOUR school right under the NKMAA logo. They are signed by GM Timmerman, and there is a place for you to add your signature. NKMAA Geup certificates are sold in packs of 25. 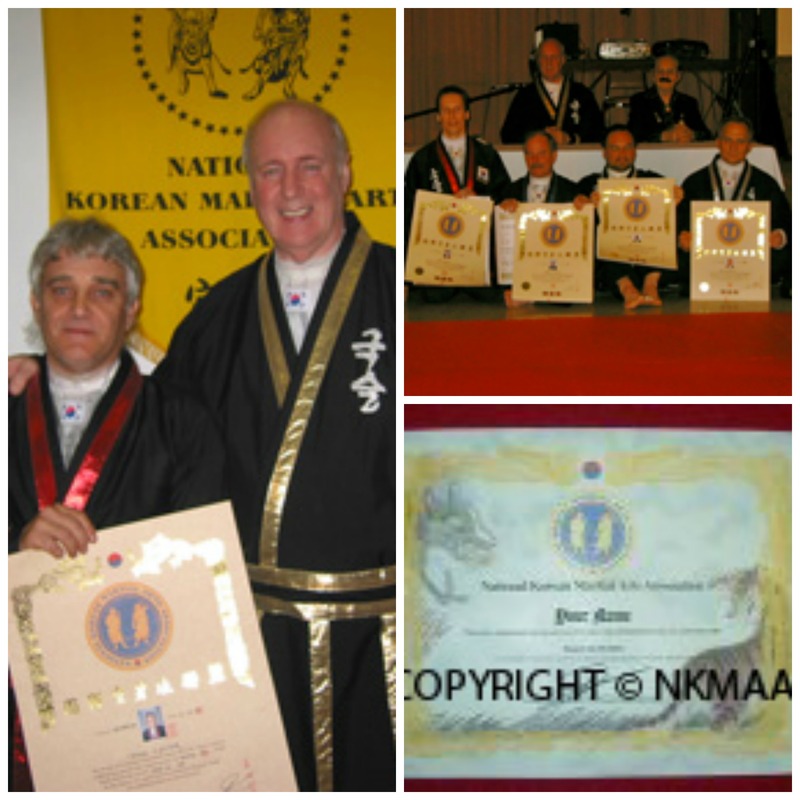 NKMAA Instructor and Dahn certificates are printed on heavy parchment paper, and they both have exquisite Gold Foil Embossed borders; however, the beauty of our certificates is not what makes them so valuable, as the true value of our certification lies in the fact that each and every NKMAA certificate ever issued was EARNED through hard work, dedication, and loyalty. We truly believe that our members would not want it any other way. A School owner my join as a regular member; OR, if he registers ten or more students, he may join as a Charter School. Because Charter School members use our services for more than their personal use, they receive a discount of 30%. NKMAA certificates have been sold (but never delivered) on fraudulent websites. Make sure that you receive a personal e-mail from me to confirm receipt of your payment. If you do NOT receive confirmation (usually within a few hours), please contact me immediately. The NKMAA Geup certificates are customized to reflect your own school name, and they are signed by Grandmaster Timmerman, with a separate signature line for theschool owner. The certificates have a beautiful design with a Dragon figure on the left top, and a Tiger figure on the right bottom. The NKMAA logo is proudly displayed in the centre, just above the area for the student's name. Your students will not only love it, they will also recognize that the certificate they earned from you has the full backing of the National Korean Martial Arts Association. 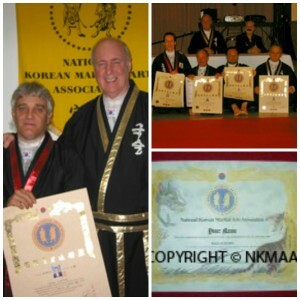 NKMAA Instructor certificates have a beautiful Gold Foil Stamped border, and they are printed on heavy parchment paper. Your Instructors will love seeing their credentials on the Dojang wall, and your clients will be impressed that your Instructors are certified with the National Korean Martial Arts Association. NKMAA Dahn certificates are also stamped with a Gold Foil border, and they are treasured by those students who have truly EARNED them. NKMAA school owners have pledged to uphold our high standards; after all, by NOT keeping the high standards of NKMAA, their OWN certification would become meaningless.